Having hard time with inventory management and an outdated store experience? Facing difficulties with expanding your service offerings and competing? Having high operating expenses because of the manual data processing? Struggling with inventory management and an outdated store experience? Your guide to digital transformation is on its way to your mailbox. Just go and take it! It’s finally ready! The app you have been working on for months is built, tested, deployed, and ready to welcome its first users; and more importantly, start bringing in some ROI. Unfortunately, making money with a mobile app is not as easy as it seems. According to the 9th Developer Economics report, more than half of all existing apps generate $500 or less in monthly revenue, while 19% of apps don’t bring in any revenue at all. Only 4% of mobile applications bring their developers $500k+ monthly. If you want your app to join the lucky 4% of profitable mobile apps, this article is for you. Discover app monetization strategies that really work and have your hard work get rewarded. From paid-for apps to affiliate marketing, there are many ways to monetize an app. Some of them are less efficient, and some work best for a certain type of app. But how do you choose the one that will work best for you? Here’s our comprehensive guide on how to monetize apps. Being probably one of the most straightforward mobile app revenue models, it implies that the user should actually buy an app in order to download and use it. While the app price can represent a certain barrier for new users, this strategy is a surefire way to get ROI. Most paid apps can usually be classified as utilities or productivity tools. Another popular type of paid-for app is the automotive app. Professional apps, including advanced photo/video editing tools (i.e. Afterlight), and games (i.e. Minecraft), often fall into the paid-for app category as well. As follows from the listed examples, this mobile app monetization strategy works best for apps that offer unparalleled value (either pro tools and utilities, or high-quality entertaining content).The price of an app can vary depending on a number of factors. For example, the same app can come at different prices for users from different countries. 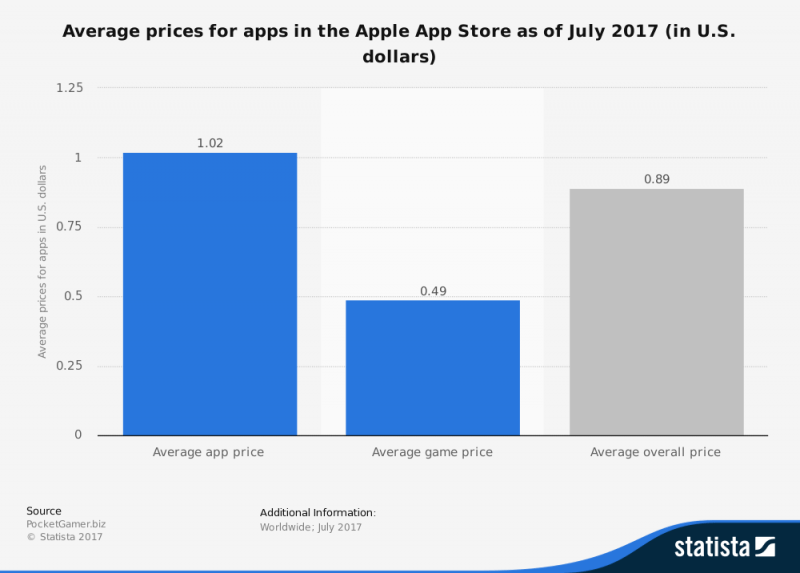 However, the average price of an app is quite low (this might be due to the fact that a higher price is harder to justify). Interesting fact: The most expensive iOS app comes at a price of $1,399.99 while Android’s highest priced app reaches only $400. The freemium app business model combines free basic functionality and “premium” capabilities. While the app itself is available for free (with a limited, basic set of features), there is a certain fee charged to access the app’s premium content: unlock additional features and advanced capabilities, customize the app, add more integrations, or remove ads. This strategy is successfully used within mobile games and SaaS products. The latter usually provides “business” and “enterprise” options at a certain cost, while basic features used by individuals come for free. A good example is Slack, a business messenger platform. Probably the most popular variation of the freemium model, this mobile app revenue model offers the ability to purchase some virtual goods within the app to augment the basic (usually free) app functionality. This might be in-game objects (for example, Candy Crush boosters), additional features (VSCO effects or Snapchat filters) and content (stickers for messenger apps like WeChat or Viber). Monetization through in-app purchases works best for iOS apps. The statistics show that iOS users usually spend 2.5 times more than Android users ($1.08 vs. $0.43 on monthly in-app purchases – per user, per app). Moreover, Asian users tend to spend more on in-app purchases than the rest of the world. Thus, you should consider your target market and localization when choosing this monetization strategy. Often applied as a part of the freemium model, this mobile app monetization strategy means recurring subscription fees (monthly/annual) rather than a one-time payment as with in-app purchases. Subscription-based monetization is very popular among multimedia apps offering various content – take Apple Music or Netflix for example. There might be various types of subscriptions, ranging from the type and amount of content available with each option, the number of users or devices that can access the content, etc. Another area of application for this app business model is the “Software as a Service” products (SaaS). For example, Zendesk, a popular customer support tool, offers a number of monthly subscription plans, differing in features as well as the number of users. One of the obvious advantages of this model is that subscription is a surefire way to ensure steady income from your app. Unlike activity-based service fees, subscription fees are charged regardless of the user’s activity in the app (even if a user doesn’t use the app, the fees will be charges until the user unsubscribes). Take into account: To get a steady revenue stream for an app from subscriptions, you need to focus on user retention and engagement. A common practice is to offer a certain test period for free so that users can try and see the value of your offering. Native ads (Ads that mimic the look and feel of the other in-app elements. For example, promoted posts on Facebook or Instagram). One more type of advertising often used in mobile apps is affiliate marketing. The examples of such a strategy can be seen in personal finance apps like Mint. Namely, the Mint affiliate program offers users with a range of related products and services, i.e. credit cards or loans. Each time a Mint user signs up for such an offering, the company gets a small fee. All in all, ads can be used across all major app types, from social networks to games and utilities. Interesting fact: Money spent on in-app advertising is expected to triple in the coming years, surging from $72 billion in 2016 to $201 billion in 2021, according to App Annie. In this case, an app charges a small fee every time a user completes a certain transaction within the app. This is usually applicable to banking, mobile payments, or mCommerce apps – apps that handle any financial transactions. One good example of this approach is the monetization of personal shopper apps. Each time a user purchases something using the app, a small service fee will be added to the cost of the item. This is also applicable for travel/hotel booking apps, including AirBnB. The latter has a number of fees, targeting both hosts and guests. Similarly, on-demand economy apps usually monetize through service fees. Pro Tip: If you decide to monetize an app through service fees, make sure the price of your offering is reasonable. You can charge a certain percent of the transaction value or set a flat fee for every type of transaction. Another popular way to monetize an app is to re-sell the data collected by the app. This might be the usage statistics, aggregated user information (anonymized), and behavioral data. The parties interested in buying such kinds of data are mostly research and analytics companies or advertising providers. This approach is usually applicable to popular apps and web products, operating with large amounts of data. Another way to make money with your software product is by granting access to your API to third-party developers. Just like data monetization, this strategy is mostly adopted by large companies. Some prominent examples include Uber or Skyscanner. Besides opening a new app revenue model, this strategy might lead to building fruitful partnerships within your market niche as well as outside of it. For example, Uber, after granting access to its API to third-party developers in 2014, was able to establish a number of fruitful partnerships. By integrating with a number of third-party apps including Expensify, Hinge, Hyatt Hotels & Resorts, OpenTable, Starbucks, TripAdvisor, TripCase, and United Airlines, the company increased its reach and gave access to millions of new users. This approach means creating an SDK (a ready-made software solution) with the main business logic of an app and selling it to third-party businesses as a turnkey solution. Thus, a business can purchase your solution, customize it, wrap into a branded UI, and start using it right away. This works well for eCommerce products, travel apps, and on-demand economy apps. Choosing the most suitable monetization strategy from the aforementioned list of app monetization strategies doesn’t guarantee success. After all, even a tried and tested strategy won’t bring the expected results if it is executed poorly. With mobile app revenue expecting to exceed $188 billion by 2020, it’s time for appreneurs to start taking monetization efforts seriously. Conduct thorough competitor/market research in order to pinpoint the most appropriate option. Always take into account your audience; spending habits differ from country to country. Identify your monetization strategy early in the process (before you start building the app). Always provide value; make sure to give your users a good reason to pay for your product. Don’t monetize your app too aggressively or too early; don’t overprice. Don’t let the monetization of your app interfere with your UX (this point is especially important for ad-based monetization). Analyze and track results constantly. To get a personal consultation on how to monetize an app, contact our sales department now and start building a profitable digital business. Get more exclusive monthly tips for your digital business right to your mailbox! How can we make the article more useful? Literacy Make less typos, mistakes, slips of a pen etc. © 2019 Eastern Peak®. All rights reserved. A new standard of excellence since 2010. Trusted by top global brands. Go to your mailbox to confirm your subscription.